A Hindu Tronder-Brunn mix ? Thread: A Hindu Tronder-Brunn mix ? Re: A Hindu Tronder-Brunn mix ? This is definitely not his best picture. He is in a way an impressive man in person and as a politician, although he is in economy to liberal-neoliberal imo. But I dont know if it makes sense to compare him directly with local European types. Although his appearance might base on basic similarities because the mixed elements are morphologically very roughly in some features similar. I couldnt find a picture of him when he was young what would be much more helpful but I think he is some sort of Nordindid with strong Weddid admixture. 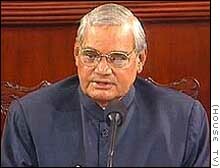 Vajpayee is very stereotypically Indian looking. He is short, medium brown in coloration and has mixed facial features. He is referred to as the "aryo-dravidian" type... a cross between the earliest aryans and the local dravidians. Punjab (where my folks are from) has seen settlements of many peoples from central asia after the aryans, primarily the scythian tribes. 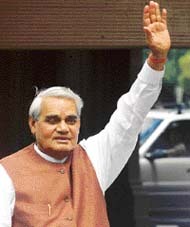 I always heard from the very "Aryan" UP Brahmans but than I saw on an Indian dating side that some of them had, like Vajpayee very strong Weddid admixture, some even more than he has. Not everytime caste is race-related even if its statistically the case. If you dont know what Weddid is, its the tribal element of India which probably predates not only the Aryans, but the Dravidians as well because the Dravidians were already a mixture of mainly Indid types with local Palaeoeuropids and Weddids. There upper class fled/expanded southwards and founded the "Dravidian" communities of today which are especially in the extreme South (Tamils f.e.) very Weddid/Australoid. Last edited by Agrippa; Tuesday, April 20th, 2004 at 05:01 PM. Amar, is that your picture in your avatar? If you feel a need to ruminate about my "CAUCASIAN" appearance, please keep in mind that such facial features are common among the people of the punjab and northern pakistan and even afghanistan. Typically you see people from that area of the world with thick beards (like I myself once had) so it obscures their facial features. However, one thing I have noticed is that all people from the subcontinent tend to have deep set eyes which are distinctly non-european. There is just something about the eyes that distinguishes subcontinentals (even the very fair skinned ones) from europeans. Hi dude. I can't access the link you provided, so I'll just say that your avatar ( you? ) looks like some sort of darker Nordid Pontid... of course, the indic influence is visible, but it's mostly in pigmentation and some minor features. So, what did you say, what caste did you mention you are...some scythian influence or what? whats the definition of "trolling" in this site? I think he's got some Australoid in him. Trönder: Where Are They Most Common?